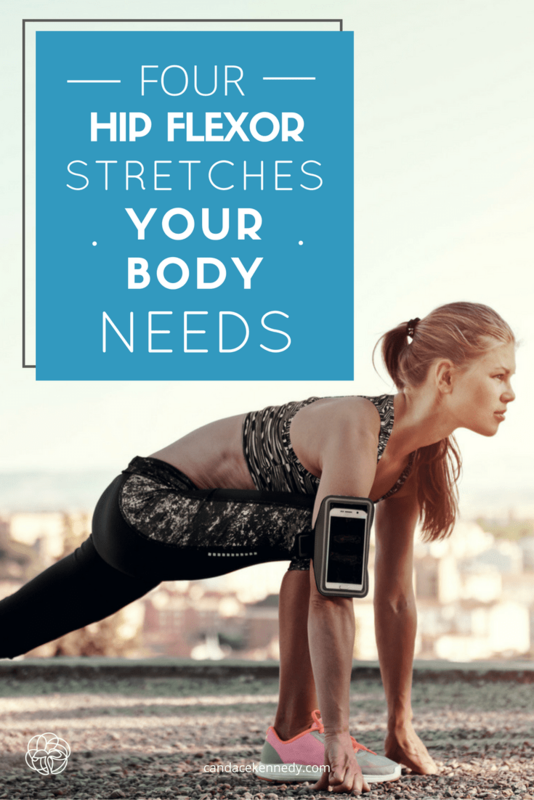 Hip flexor tightness may seem like something to overlook. But, the problem is, parts of your body – say your feet – aren’t meant to absorb the impact and stress that your hips are designed to do. So, these areas will be forced to overcompensate when your hips can’t support. In the case of your feet, that could lead to pronation and even plantar fasciitis. That’s why adding hip stretches into your routine is so important. This is an easy stretch to do just about anywhere since you do it standing and it doesn’t require a wall or any equipment. Stand tall with hips squared and your shoulders over your hips. Step back with your left leg, bringing your left foot about 1-2 feet behind you, depending on your height. Distribute your weight between your right foot and the left ball of your foot. Square your hips and gently press your left hip forward and right hip back until you feel the stretch. Hold for 20 seconds, then switch sides and stretch your right hip flexor. Do each side 2-3 times. This stretch is great for the hips and is also an effective stretch for your inner thighs. Sit on the floor, with legs out in front of you. Bend at your knees and bring both feet in toward your body, keeping your spine tall and shoulders back. Touch the soles of your feet together. Let your knees fall to the side. Play around with the intensity in several ways. Hold the stretch for 20-30 seconds and repeat 2-3 times. This is a great stretch for any level of flexibility. Begin in a standing position with feet parallel and hip distance apart. Bend at the hips and knees to bring your hands down to the floor so they are resting at the outside of your feet. Step your right foot back and extend your right leg behind you, trying to make the right leg straight, while keeping your left leg at a 90 degree angle. You left knee should be directly above your left ankle. Press your right hip toward the floor and hold this position for about 20 seconds. Switch legs to stretch your left hip. Repeat each side 2-3 times. This is a more advanced stretch for those wanting to really open their hip flexor and release their lower back. If you have a limited range of motion, you can always try this stretch one leg at a time. Lay on your back in a comfortable position. Bend both of your knees, raise your feet in the air, and take hold of the inside of your feet with both of your hands (right hand holding right foot, left hand holding left foot). Pull your knees toward your upper body and your feet back until the bottoms of your feet are facing the sky. You can continue to use your hands to gently pull on your feet, until your reach your desired level of stretch. If you feel a strain in your lower back, release one foot and try this stretch one foot at a time. Let me know your favorite hip flexor stretches in the comments below!